If you’re like us, you are in the midst of hopping planes, building agendas, requesting meetings and packing up those ever-so-lovely back walls, banners and kiosks. What are we referring to? You guessed it – trade show season! If trade shows are a big part of your marketing strategy, you’re probably asking yourself, “How can I make the most impact on this travel time and expense?” Let’s be honest, shows are a big investment and one you want to protect. There’s not just booth space or sponsorship fees. Flight travel, hotels and per diems can really add up. So what are some strategies that can help ensure your ROI and really capitalize on that precious time spent outside the office? Lucky for you, we talked with some fellow trade show veterans and compiled these six tips that will ensure your trade show season is an absolute success! 1. Promote your presence at the show. Obviously, you want people to know you’re there, right? With today’s Connection Economy, you have PLENTY of options to do just that. First, research the event details. If there’s a specific hashtag for the event, use that in your social posts leading up to the show and tag the show name or the show host in your posts as well. Be sure to let people know in your posts that you’d like to meet while in town. Twitter and LinkedIn are terrific for finding other show attendees and making connections before you arrive. Depending on your marketing budget, you might want to try a few of these options as well: an email campaign to targeted lists, ads in the show directory (Come Visit Us at Booth #100 for a free demo!) or a show sponsorship to brand your business throughout the show floor. A few weeks before the show arrives, sit down and make a list of the companies and people you would like to meet. Don’t just think about who the perfect business prospect might be; look for industry contacts that could provide useful tools for growing your business or even new advertising avenues for your marketing team. Reach out to them via social, phone and or email and schedule a time to meet. As an exhibitor, you may have the benefit of receiving the attendee list in advance of the show you are attending. Once you receive it, go through and highlight anyone else that you want to add to your meeting wish list and reach out to them. You will want to start working on your appointments 30 days in advance of the show. Schedules fill up very quickly! 3. Don’t forget about breakfast, lunch and dinner! Don’t treat these as a break! The dining table can be a great spot for meetings to occur. Check your database for prospects or customers in the area and spend this time connecting or invite someone you meet at the show. If you do decide to include these in your schedule, you will want to make sure you make reservations with the restaurant in advance. Depending on the market, you could end up waiting a while for a table. 4. Attend any of the evening functions each night. This is a great place to meet people and network in a more relaxed setting. A lot of deals can be done after hours! You might even consider hosting your own “happy hour” at a venue near the trade show space. Print up some business cards on the cheap and include an invitation to your custom event. It’s a no pressure way of making some connections and putting your name out there. Plus, who doesn’t love a great happy hour after a long day on your feet on the trade show floor? 5. Schedule some time to walk the show floor yourself. Don’t just mindlessly stair at your watch as booth traffic slows down – use that time to uncover prospects or partnership opportunities and stay up to date with what’s new in the industry. Let people know who you are and how you can help them and/or their customers. Just try not to go overboard with taking all the trade show chachkis – you only have SO much room in the suitcase! 6. Are you a new exhibitor to the show? If so, make sure to reach out to a sponsor or veteran to be a potential mentor. Have a call with them before the show and discuss your show goals with them. You’d be surprised who is willing to help newcomers to the industry. The success of the show is a benefit to everyone – after all, the exhibitors are paying for it! Let them know who you are looking to meet at the show. They will likely be more than happy to make an introduction. Also, schedule some time to meet with them at the show (see #2!). We hope your 2017 trade show season is a big success! With these tips in mind, hopefully you will have full confidence that the time was very well spent. So what shows are you prepping for? Below are a few we’re gearing up for in the coming weeks. If you are attending any of these, drop us a line and let us know how we can help! 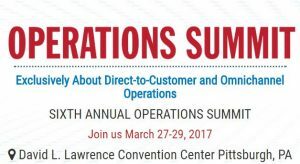 a2b Fulfillment will be exhibiting (booth #216) at the Operations Summit in Pittsburgh, Pa. March 27-29. Let us know if you plan to attend or would like to meet us while we are in the Pittsburgh area! 2017 Response Expo in San Diego, Ca. April 25-27. Email our VP of Business Development, Debbie now if you would be interested in meeting to discuss your Direct Response Fulfillment needs! As a Direct Selling Association Supplier, a2b Fulfillment excited to be exhibiting (booth #202) at the DSA Annual Meeting in Orlando, Fl. June 4-6. DSA’s Annual Meeting is the premier event for the direct selling channel, where executives from across the industry and around the world unite to discuss current trends, challenges and issues.